Can you imagine, you’re locked in isolation, in a notorious Nazi death camp, no less? Corrie ten Boom spent many days alone, praying; trying to recall the happiest moments of her life, as she faced the inevitable. Yet, one thought filled Corrie’s heart above all—she must share the good news with others there. Good news? Had she been in isolation so long, she had lost her mind? At night, in the eerie stillness, when the cries and screams of others ceased for too few hours, Corrie found courage in the words of a little book that hung from her neck. Corrie and her sister Betsie would read the little book—an underground Bible, secreted into the prison—to other prisoners, to encourage them also. Though still a great mystery to many of them, the words in the little book brought comfort and hope; taking all their minds far from the dark images of Ravensbrück prison. As I write this, a simple parable, I pray the truth of that same great mystery will dawn clearly in some seeking heart. Long ago, a great and powerful king ruled over an indescribably beautiful kingdom. The countless souls there worshiped the king and delighted in all his many wonders. They relished the joyous celebrations and seeing the king in all his splendor. Love, above all, shone like the sun in that wondrous place; permeating each heart with joy beyond anything one could ask or think. Somehow, the king provided for every need, and his subjects lacked nothing, for all his unending kindness. How he did it, no one knew; neither did any think to question! How does one describe such a place? The perfect melding of color and light, masterful music and gaiety, afforded a great sense of freedom and belonging. Millions upon millions of souls, with as many gifts and roles to play; each one complementing every other, like a grand symphony. One day, as the king paced the bright corridors of his kingdom, he began to ponder… Would his subjects grow weary of so much goodness? And what would they choose, if they could go elsewhere and serve another? After all, they had never been given a choice, but to remain with him. So, how would he ever know if they truly loved him, and would not choose otherwise—unless he gave them a choice? Finally, the great king knew what he must do. The king would prepare another place; a unique new kingdom, where every soul would be free to make an all-important choice. He would give each one a unique, mortal body to move freely there. Oh, the king would watch over them; with signs to help them remember him. And he would answer, should they call out to him. But the decision must be theirs, each one—to love and return to him; or be lost to him forever. He named their new home “Adamah,” where they would have everything needed to sustain life beyond his kingdom. First, there must be pure air to breathe, for their new bodies; and livable temperatures. Adamah would be filled with grand music to inspire; ideas to explore and challenge every soul. And above them, the heavens to cause wonder. There would be light and water; green valleys and majestic mountains; plants and trees for food and shade. He would provide a wondrous variety of creatures; livestock to till the ground and supply food and leather and wool for clothing. And there would be elements in abundance, for making tools and building shelters. Everything, except his reigning presence! The great king would make the mortals much like himself; able to reason and invent—if not to create. They would need strength and wit, and the will to survive where weather and terrain, seasons and vast ideologies would prove a constant challenge. Moreover, they must be mindful of others, beyond their own well-being. “Each life is precious, infinitely valuable to me,” he would assure them. Of course, there must be certain limits to maintain, so there could be peace and order among all. The rest would be up to them. They must choose; each one. The king’s heart longed for each beloved soul to choose wisely; although he knew the end of all things. Still, each heart must decide—before time would run out. Yes, each soul would have just so much time on Adamah to solve the mystery of true life as the great king planned it. First, the king created two mortals who would become the bearers and caretakers of new ones who would come after. Each soul would enter the mysterious, new kingdom as an infant being; male or female, the king decided. Importantly, once a soul left the great king’s realm, they would have no recollection of the place they had always called home with him. But loving them, he placed in each mortal heart, a deep longing for that goodness he hoped would prove their character and turn them back to him one day. They would have dominion and stewardship over Adamah and all the other life there. But, the hardest thing to manage, would be their relationships with one another. Unbridled emotions that over-indulged that which was dearest to them, would prove a constant heartache and distraction. And PRIDE would be the mortal enemy of their capacity to love unselfishly and forgive generously. Above all, they must overcome the craftiness of a divisive and relentless adversary—a bewitching, ever-lurking and lying spirit, who would covet the place of king over all, if they allowed. Many would be blinded by his deceptions. Sadly, the great king knew many would be so entranced by the mysterious kingdom, they might choose never to seek him. Many would rebel against any thought of the great king, and work against those who believed. The worst could commit the vilest acts and give rise to wars, as some greedily claimed all power for themselves. Carelessly, some would destroy millions of infant lives, struggling to enter the new kingdom. Still, every soul must have the freedom to choose; even through great tribulation! So, it began. And just as he had foreseen, many rejected any thought of the great king. Finally, to help them understand his great heart for them, he decided to become one of them; flesh and blood, living among them. Maybe then, they would choose his perfect, unconditional love, over any enticement there. Sadly, some rose up violently and put him away from them for good—or, so they believed. 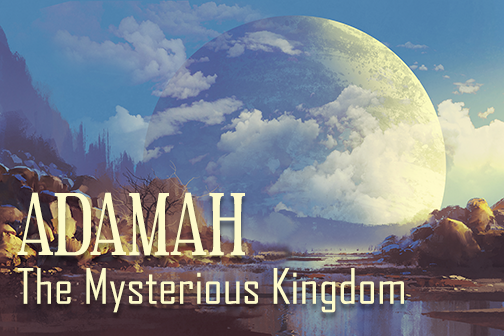 But, for all those who rejected the great king’s invitation, life on Adamah would remain a blur of unanswered questions; a great, unsolved mystery. False teachings and strange philosophies; deviant activities and un-kingly pursuits would tempt, where truth and conscience were absent. Many would understand too late, how like a vapor the kingdom called “Adamah” was meant to be! Yet, while there was still time to believe, the merciful heart of the great king could still be known. And all who chose him found hope and joy; trusting that he would keep his promise, and rescue them one day from the mysterious kingdom of Adamah. In the fearsome grip of the godless Nazi regime, Corrie and Betsie ten Boom shared the good news (the gospel) with many facing death in Ravensbrück Concentration Camp. Many found peace and hope, knowing that by God’s grace, through faith in Jesus Christ, there is forgiveness and victory over the darkest situations of our lives; even death. He has given every person on Earth, freedom to choose. We can place our trust in this life only—this temporal and “mysterious kingdom,” with all its allure and deception—to our eternal regret. Or, through faith in Jesus Christ, as Lord and Savior, to choose true life with the Great King, forever! The day of the Lord will come, regardless of what one chooses. The important thing is to be right with God before that valley of decision. The choice is ours!